The problem of kidney stones arises because of the crystallization of certain chemicals or minerals in the urine giving rise to different types of kidney stones like uric acid kidney stones or calcium stones. At the time of formation these kidney stones are actually miniscule, smaller than a grain of sand, and may cause no visible symptoms at all. But they tend to grow larger over time reaching up to a tenth of an inch or even larger. The size of the kidney stones however is not always as much of a concern as would be the location of the kidney stones. If stones develop or are present in the urinary tract the condition is referred to as urolithiasis, while the presence of stones in the kidneys is referred to as nephrolithiasis, and stones lodged in the ureter are referred to as ureterolithiasis. If the stone is located in such a position as to cause a blockage or obstruction of urine flow, then it could be problematic. 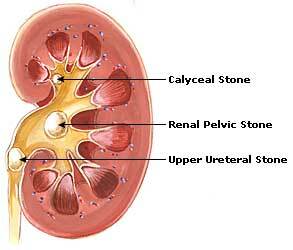 Kidney stones usually cause severe pain in their attempt to pass down the ureter on their way to the bladder. The pain is first felt in the side and, therefter, in the groin and thighs.